CNN anchor Don Lemon didn't hold back in reacting on air to the news of Aretha Franklin's death live on the air, celebrating the icon and remembering his friend through tears. "I'm sorry," he said while crying. "I just woke up and got the news. I'm so sorry. I didn't expect to have this reaction. It's sad... we lost a legend." Lemon grew even more emotional recalling how Franklin would text him "out of the blue" to compliment him on his work. "She'd say, 'I saw something you did on CNN and I'm so proud of you, and you're doing such a great job.' And to think that won't happen anymore is just really awful," he said. "It's hard to even think that I'm referring to her in the past tense right now," Lemon said. "But I know what she would say. She would say, 'I want you to be strong, Don.'" The "Queen of Soul" became friends with the Lemon after Franklin saw his reporting on TV and got in touch with him to express her appreciation. 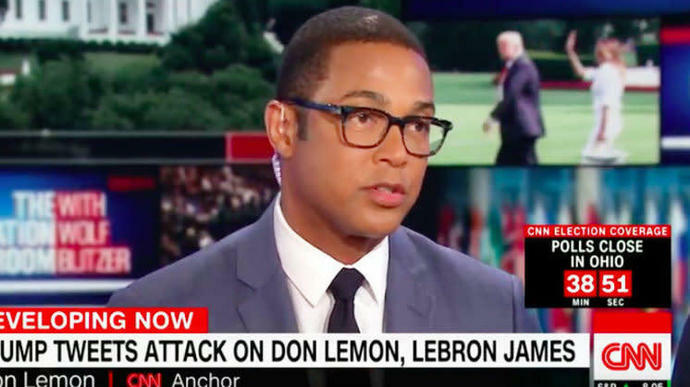 She appeared on his CNN show in 2015, and over the years Lemon regularly attended her birthday parties in New York. "You never knew who was going to show up," he said. "Aretha was the biggest legend but it would be one legend after another, and she just ate it up," he said. "She loved it." Take a look at the video above to hear Lemon remember his friend.